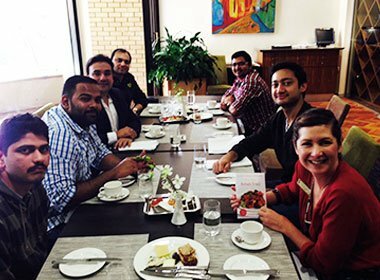 Le Cordon Bleu Sydney were fortunate to have a visit from renowned restaurateur, chef, blogger, and author Monish Gujral. His grandfather, Kundan Lal Gujral, is famed with inventing the ever popular butter chicken and dal makhani, and opening the Moti Mahal Restaurant. Monish has since kept his grandfather’s tandoori cuisine legacy alive by expanding the brand and launching a chain of restaurants. Monish is a bestselling author, with his cookbooks On the Butter Chicken Trail, On the Kebab Trail, and Moti Mahal’s Tandoori Trail topping the bestseller’s list in several countries. He is also an avid and awarded food blogger. A handful of staff, chefs and students were lucky enough to sit down together with him for lunch at the Ambassador restaurant, Ryde Campus, where Monish kindly donated some of his books to our library as well. You can learn more about Monish Gujral and his blog.